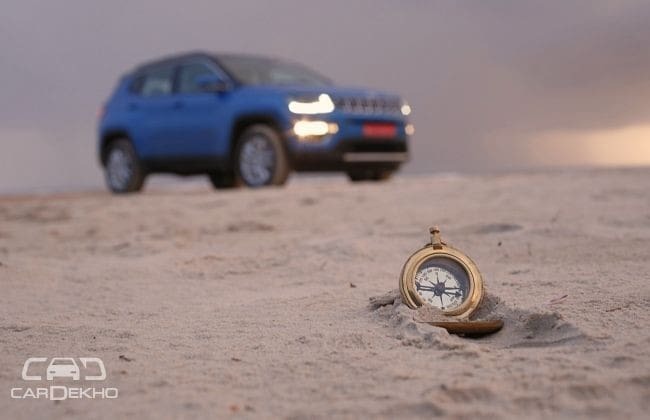 With its launch around the corner, the Jeep Compass is all the hype in the Indian auto space these days! Having the highest levels of localisation in its segment, all eyes are on its pricing as it is expected to undercut its peers. Here’s what we know about the Jeep Compass so far. The Jeep Compass is an outcome of the Rs 1,800+ crore FCA (Fiat Chrysler Automobiles) poured into its Ranjangaon facility more than two years ago. It made its world debut in September 2016 in Brazil and the India-spec SUV was revealed to the media in April 2017. It is Jeep’s first made-in-India SUV and will be retailed through exclusive Jeep dealerships along with FCA (Fiat Chrysler Automobiles) ones as well. FCA Opens Destination Stores; Fiat, Abarth and Jeep Vehicles, All At One Place! At that price point, the Compass will fall in the cross hairs of a lot of SUVs such as the range-topping variants of the Tata Hexa and Mahindra XUV5OO along with the Hyundai Tucson and Honda CR-V. By next year, it will also have to compete against the fifth-gen Honda CR-V and the Skoda’s replacement for the Yeti, the Karoq. In India, the Jeep Compass is available with two engine options – a 1.4-litre MultiAir II turbo petrol and 2.0-litre MultiJet II diesel. Both the engines are borrowed from Fiat (Jeep comes under FCA’s umbrella). While a 6-speed manual is standard with both the motors, the petrol can be had with a 7-speed dual-clutch automatic as well. For now, the four-wheel-drive option with driving modes can only be had with the diesel engine. The Jeep Compass is available in three trim levels – Sport (base), Longitude, Limited (top-spec). There are two more optional trims as well based on the top-two variants – Longitude (O) and Limited (O). In all, there will be 10 trim levels to choose from.